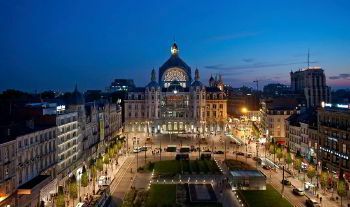 Antwerp captivates with its crazy blend of beautiful Renaissance architecture and modern entertainment facilities. Visiting Antwerp once you can't but remember the fabulous time spent here. Fascinating Grote Markt van Antwerpen, Beguinage, Town Hall, Central Station, Carolus Borromeus Church, Steen Castle, St Jacobskerk, Peter Paul Rubens Statue and a series of other landmarks are sure to impress any tourist and remain in memories forever! Dealing with reliable car rental companies is always beneficial. Acquiring the multiple positive reviews left by real customers as a pledge for reliability, you won't get disappointed with your choice! 8Rental is one of such services and has gained a positive reputation among customers from all over Europe and even beyond its borders. People count on us as they are sure we won't ever let them down! Every order is approached to with a high sense of responsibility and respect. Yes! We respect our clients and put their convenience above everything. Selecting 8Rental as your transportation means in Antwerp or any other city in Europe, you are making the right decision. Even if you are to rent a bus with a driver in Antwerp, 8Rental is the best destination! Hence, if you are to organize a tour for a large group of tourists, you won't find a more reliable chauffeur service. Together, we shall make this tour a fantastic dream for your guests! Get a quote from 8Rental now and get a fabulous colossal coach drive you in Antwerp! What the entire fleet of vehicles 8Rental has is composed of premium level cars, vans, and buses. 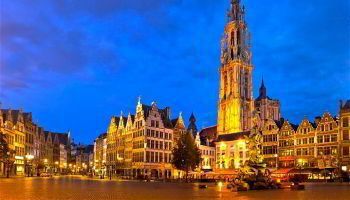 It's particularly buses you should pay close attention to if you intend to introduce the beauties of Antwerp to a large group of foreign visitors. These vehicles are fantastically convenient, fast and look stylish. For large groups (around sixty-five people), 8Rental advises hiring a Mercedes Tourismo. This bus is in excellent condition and will drive all of you safely along Antwerp's roads. The model has such specifications as air conditioning, central heating, toilet, super-comfortable seats in aircraft style, a fridge, water-filtering coffee machine, etc. Another excellent model you can choose to rent a bus with a driver in Antwerp for relatively smaller groups of tourists (up to two dozens) is Mercedes Sprinter. It will allow going long distances with no hustle and bustle. The interior of the vehicle is upholstered with leather, and there are all specs you can expect from a premium coach. Regardless of the model you finally stop your choice on; you are guaranteed to love the comfort it provides while driving. 8Rental has employed a staff of amazing drivers all of which are licensed, skillful, experienced and trustworthy. They ensure you convenient and safe transportation regardless of the direction you need to take in Antwerp. Booking a bus from 8Rental, you get the chance to choose the language your driver is to speak. Besides French and German speaking drivers, we have those who master English, Russian, Dutch and other. Before employing a driver, 8Rental makes sure the driver has at least several years of practice in the sphere of passenger transportation, as well as good recommendations from previous employers. Therefore, you can book a bus being entirely confident in the professionalism and competence of our chauffeur. Choosing 8Rental as your car rental service in Antwerp, you will be provided with free of charge fuel and insurance. All the taxes and fees are our responsibility, as well. You see how beneficial dealing with 8Rental is!